Connect with our BCA MENTORS. Welcome to our Bluewater Cruising Community! 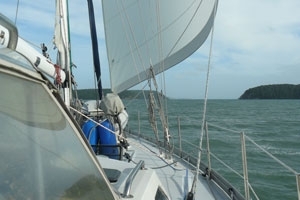 The mission of Bluewater Cruising Association is to foster seamanship and friendship for people with an active interest in offshore cruising. We achieve this by providing a forum for communication and information exchange among members through regular meetings, social events, courses and especially, the Association's widely acclaimed publication, "Currents". Education is a cornerstone of the Association. We teach aspiring offshore sailors how to prepare themselves and their boats for sailing beyond protected coastal waters. Sail around Vancouver Island, to Mexico, to Bora Bora or around the world! We can help you realize your offshore sailing dreams with the appropriate marine courses, a focus group of sailors like you getting ready to go, an offshore trial voyage and guidance from experienced mentors. To learn more, please click the blue Education button on the left side of the page. BCA's membership is diverse and includes a wide range of experience: "Doners", who have returned home after completing an offshore passage; "Doers", who are still out there cruising; and "Dreamers", who are considering or actively planning an offshore adventure. Click here to join the Bluewater Cruising Association now!